He advised the Trump administration and broader Republican Party to reject acceptance of amnesty proposals modeled after the Obama administration’s Deferred Action for Childhood Arrivals (DACA) policy and to prioritize the ending of chain migration and national implementation of an E-Verify usage mandate for employers. Wilcox made his comments during a Thursday interview on SiriusXM’s Breitbart News Tonight, hosted by Breitbart News’s Executive Chairman Stephen K. Bannon and Senior Editor-at-Large Rebecca Mansour. If we’re going to stop any future amnesty, we have to have national E-Verify, which essentially allows employers when they’re hiring someone to go onto a free government website to check to make sure that they person they’re hiring, or the person they just hired, is employment authorized. If we did that, that would get rid of the job magnet for the most part and would disincentivize further illegal immigration. It’s never worked. America has instituted previous amnesties over the years. Everyone’s familiar with the big one in 1986 which, allegedly, at that time there were 1 million, 1.3 million illegal aliens in the United States, and then I think over 3 million came out of the shadows to take part in that amnesty, but the only effect that amnesty had was to increase the numbers of people coming across the border unlawfully in hopes that another amnesty would be implemented. Time after time, this has happened. The Obama administration’s DACA policy, said Wilcox, incentivized and increased the volume of unlawful immigration to the US. DACA’s approval rate in issuing work permits to applicants was over 98%, said Wilcox, framing the policy’s background checks and vetting processes as amounting to a “rubber stamp.” Such lax screening, he said, opened up a vulnerability to national security. 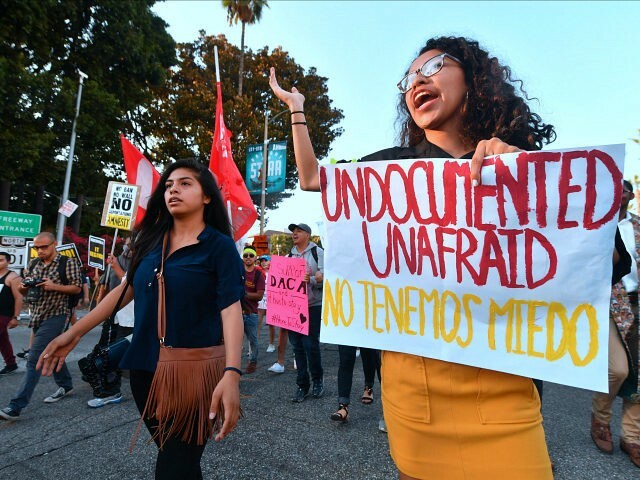 “We’re talking about an amnesty now where we have people who were lightly vetted, and we really don’t need that,” said Wilcox of any DACA-themed legislative amnesty proposals. Only roughly 900 DACA recipients have served in the military. Now, if you take the total population of DACA, which is somewhere around 800,000, that’s one-tenth of one percent. So no, that’s not true. When you look at the valedictorian question, studies have shown that nearly 25% percent of DACA recipients are functionally illiterate, 46% have only basic English ability, and less than half have graduated from high school. We’re not talking about kids who were born here. We’re talking about kids who were born in a foreign country who have crossed our border illegally or flown in and overstayed a visa unlawfully. They were raised by non-English-speaking parents, mostly… three quarters are from Mexico. So they were raised by parents who don’t speak English. They’re bilingual. So, say for instance, these three-quarters [of DACA recipients] that came from Mexico, they know Spanish. People have asked, “Well, how can you send them back? They’ve grown up here, all they know is Spanish.” No, that’s not true. What language do you think they spoke in their homes from zero to five before they went to school and we were forced to provide a free public education to them? They spoke their parents’ native language. What language do you think they speak to their parents in today? Their native language. So, it’s not true that these individuals would all of a sudden find themselves in a foreign country that they have no connection to and don’t know the language.